Hello! The DeNami Design team has another Product Spotlight to share with you today: it's the cling-style Starry Burst stamp. I used it to take a clean and simple approach to a thank you card. The only other items I needed for this card were the Brushed Thank You stamp, Tuxedo Black Memento ink, some Copic markers for coloring, white cardstock, and a corner rounder. Looking for some more ideas for this unique starry stamp? Be sure to check out the rest of the team's lovely creations today on the DeNami blog. Like what you see? 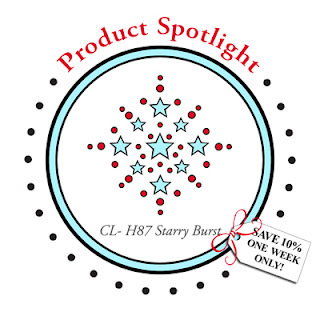 Then you can score a great deal on the Starry Burst--as our Spotlight Product, it's on sale at 10% off for the next week!! 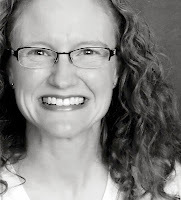 Love how you colored in this image! It makes a very cheerful thank you card! Wow I love how this image looks coloured. Beautifully CAS Emily. This is awesome! Love the design you created with this and the sentiment in the lower right. Wonderful pattern you created with the stamp and love the punched corner. What a fun design Emily! Very pretty card!! Love how all of you came up with such different uses of that stamp! Your card is truly delightful! Emily, I love how you colored your starry burst with different colors. So pretty! It's so neat the way this star burst can interlink with itself to create a brand new design! So "Independence Day-ish"!